HAKAINDE Hichilema is trading on the lines of treason, if the police arrest him, he should not complain because he is inviting trouble, former Home Affairs minister Lameck Mangani has said. And Mr Mangani said whatever UPND former vice-president for politics Dr Canisius Banda advised should not be taken lightly, “let them take his advice seriously on party organisation and mobilisation that was the only way that would save the party from the current crisis.” In an interview with the Sunday Nation, Mr Mangani said revelations by Dr Canisius Banda stating that the UPND did not win the August 11 elections made very interest reading. Mr Mangani said it was true that the Parallel Voter Tabulations (PVT) done by the UPND had a lot of mistakes. He said some of the mistakes in the UPND PVT could have been made intentionally to project that possibly the party performed very well. “But the best advice I would give is that let the UPND leadership possibly not open a Pandora’s Box by continuously talking about the elections. The elections are over, the president was declared by ECZ that he won the elections. “If you start talking about elections, others will also start talking about how the UPND conducted elections in Southern province over the issue of PF polling agents who were chased from the polling stations,” he said. Mr Mangani wondered what the motive was for the UPND to have chased PF polling agents who were threatened that if they stayed around they would be killed because there were no cameras. 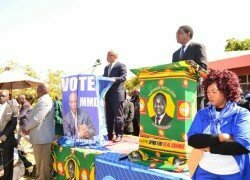 He said the best medicine he could give to the UPND was to stop opening the Pandora’s Box. Mr Mangani said the UPND should go back to the drawing board and start organising itself and aim for 2021. He said claims by the UPND leadership of saying Edgar Lungu was not President was simply inviting problems because the Constitution was very clear on the matter. “It means HH is trading on the lines of treason and if the police moves in, it will create a problem and they will think that the Government is being unfair. So at this stage I think the electoral issue should be buried,” Mr Mangani said.